This community-owned day lodge in the Boulder Mountains outside of Ketchum, ID, serves as a cozy base camp from which to enjoy some of winter’s best offerings: snow sports, food, friends and fun. In partnership with the Blaine County Recreation District, Galena Lodge offers more than 50 kilometers of trails in the Sawtooth National Forest back-country for a variety of snow sports such as sledding, cross-country skiing, ice skating and snowshoeing. 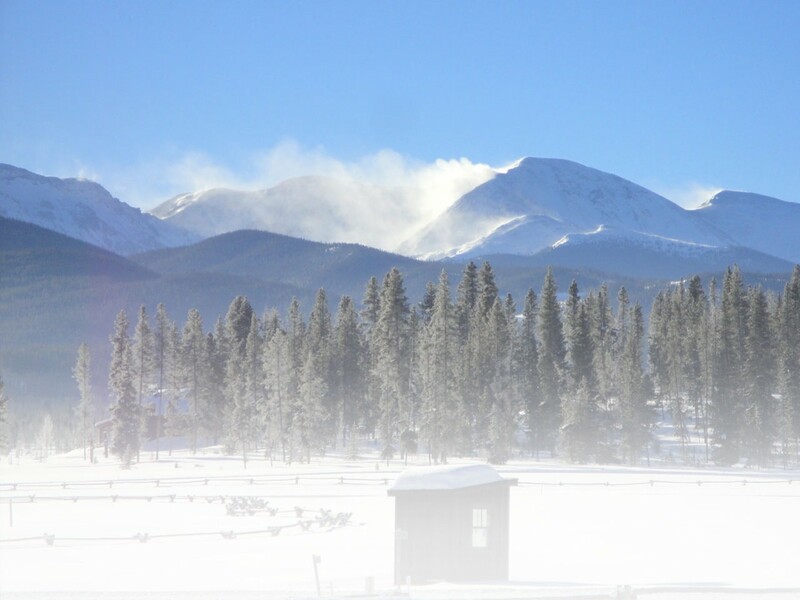 With at least half of these trails reserved solely for snowshoers, Galena Lodge is perfect for families, couples, locals and visitors seeking a remote snowshoeing retreat. Snowshoeing in the woods at Galena Lodge. Proprietors Don and Erin Zell have been running the lodge for nine years along with their two “loaner” dogs, Sadie and Zeke, who can often be found accompanying guests on the trails. Erin describes their operation as a “restaurant with a ski problem.” Thanks to Don’s culinary background and lots of local support, this energetic husband-wife duo is proud to offer a variety of dining options from daytime snacks to keep you warm and energized on the trail to special community dinners, and even catering options for groups and overnight guests staying at one of the property’s rental yurts. A sample menu from one of their popular full moon dinners includes a mouth-watering selection of dishes made from local ingredients such as potato sage soup, grilled elk tri-tip and Idaho ruby trout. After dinner, you can join your meal mates for a moonlit hike on the easy Cowboy Cabin Trail which hugs the bank of the Big Wood River for a unique snowshoeing experience. For a safe and informative introduction to the sport and the terrain, join a free tour guided by the U.S. Forest Service every Thursday morning at 11 a.m. You’ll learn tips about snowshoeing and tidbits about Idaho’s history, culture and environment. Private tours can also be arranged at the lodge. Trail passes and rental equipment are included with all tours. For a greater challenge during the daylight hours, check out one of Erin’s favorite snowshoe trails dubbed Psycho Adventure, a five kilometer loop with a black diamond rating. Don’t be put off by its daunting moniker—Erin swears by the beauty, stillness and quietude it will lead you through. As one of the longest groomed trails in the North Valley, this is also one of the most remote trails and thus one of the best bets for catching glimpses of wildlife. Fox, coyote and wolf are commonly found in this region, as well as a variety of birds. It is also an area that is being monitored as a prime habitat for lynx, although no sightings have been confirmed. Wildlife encounters are even more likely during an overnight stay at one of Galena’s yurts nestled deep in the quiet woods where guests are invited to fully disconnect from the demands of daily life and re-connect with nature. Similar to a tee pee on a wood platform, yurts were commonly used in ancient times by Central Asian nomads and provide a comfortable way to enjoy the great outdoors year round. Overnight guests are able to access the 25 kilometers of snowshoe-designated trails right off of their front porch, even at night, if they wish. Equipped with kitchen utensils, board games, cots, solar lighting and a wood-burning stove, the Galena yurts offer a comfortable, rustic back-country experience. A cozy, rustic yurt at Galena Lodge. A variety of other lodging options are available in the nearby towns of Sun Valley and Ketchum, an area so enchanting that Ernest Hemingway made it his home during the final days of his storied life. Whether it’s the powder-light snow, bluebird skies or agreeable high-country culture, the setting that surrounds Galena Lodge makes for an endearing and unforgettable snowshoe destination. Pass rates: $5 ages 12+, Free for kids under 12. Equipment rentals: $15 per day. MSR and Atlas snowshoes, poles and gaiters available. Pet Policy: Pets welcome at no additional charge. Lodging: Rustic yurts available for rent with a reservation. Dining: Lunch is served daily in the lodge from 11:30 a.m. to 3:30 p.m. during the winter season. Family-style community dinners are offered by reservation for special events and holidays. Tours/Events: Monthly full moon dinners and guided tours by reservation only. Community dinners throughout the holidays, dates and times vary. Free guided snowshoe tours Thursdays at 11 a.m. with the forest service. Visit galenalodge.com for more information. Return to the full list of Nordic Centers. No. 4 Snowshoe-friendly Nordic Center: Lapland Lake Nordic Vacation Center, Northville, N.Y.